There’s something oddly enjoyable about the simple premise of this game. 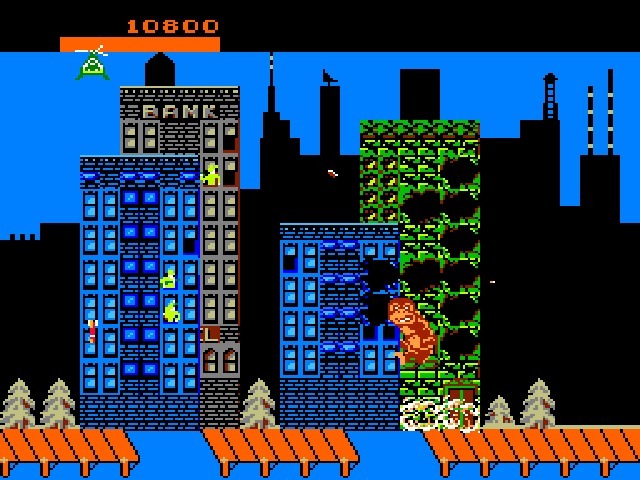 Following in the traditions of classic B-movie monster flicks, the entire point of Rampage is to play as a mutant monster and destroy everything you can. They don’t make games like this anymore, which depending on your view of classic arcade games, may or may not be a blessing. No, monkey! NO! That's a bad monkey! Gameplay couldn’t be simpler. You control either a giant lizard or a giant gorilla, with one button to jump, and another to punch/grab. Using these abilities, you will scale buildings and punch holes in them to reveal items inside. These items can range from food to poison, with new surprises making their appearance as the game progresses. The same button used to punch will also grab and eat whatever object is in front of you. Eat the food and you get a health bonus, eat the poison and you lose health. After you punch enough holes in a building, the structure will weaken and collapse. From there you’ll jump off and move on to destroy the next one. The punch button also allows you to destroy the cars, choppers, and tanks that surround you, as well as snatching soldiers from windows and eating them for health. Obviously 128 levels of the same thing has the enormous potential to get boring, and this is the game’s greatest downfall. Rampage does do the most it can to keep you interested, adding new items and hazards all the time. The settings also change slightly and become more populated as you progress. 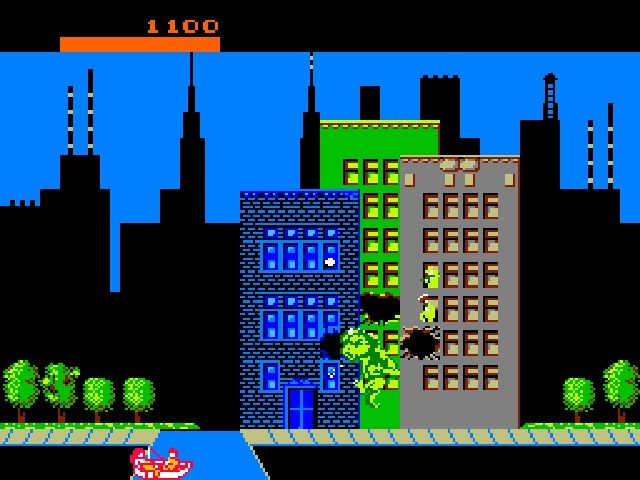 However, you will always be punching buildings, eating food to stay alive, and getting shot at, level, after level, after level. Simply put, if you are not instantly hooked by the end of the first “day”, you will find the rest of the game a huge waste of time. The save state feature of the emulator makes it easy to pick up where you last left off and break the game down. But regardless, if you’re bored by the first few levels then move on because nothing huge is going to change. Not everything you can eat is good for you. If you love wrecking everything in sight, then the game can be quite fun, despite some clear flaws. The graphics are quite dated and somewhat lacking, even by NES standards. Everything is understandable however, and though the buildings may not be overly detailed, they are still satisfying to demolish. The controls are easy enough to get used to, and they work well with the simplistic nature of the game. The music can get annoying, with the same short background theme running over and over again. The theme is different for each character, but is only a loop of maybe five seconds at the most. The sound effects generally cover the lacking music with abundant shots and explosions, yet they are weak and sound somewhat like cap guns. The audio is definitely the weakest point, though the squeaky crunch of the characters as they chew is priceless. At times Rampage is as much a satire of classic monster movies as it is a video game. Even if the humor doesn’t matter to you, you can still appreciate the unique gameplay. No other video game focuses solely on total destruction quite like Rampage does. It’s an interesting concept, and an enjoyable one for short periods of time. There is no way you’ll beat the game in one sitting unless you are absolutely in love, and have more free time on your hands than mortal man should have, but it is certainly worth playing occasionally, saving, and picking up your quest later. If you like destroying things (as most people do) then this game is worth a look. Rewards you for destroying as much of urban USA as inhumanly possible. 128 levels of the same thing with only minor variations.